Carmageddon is coming, so get ready to get you and your Dodge the heck out of Dodge, or at least as far away from the 405 Freeway near the Sepulveda Pass in the middle of July. 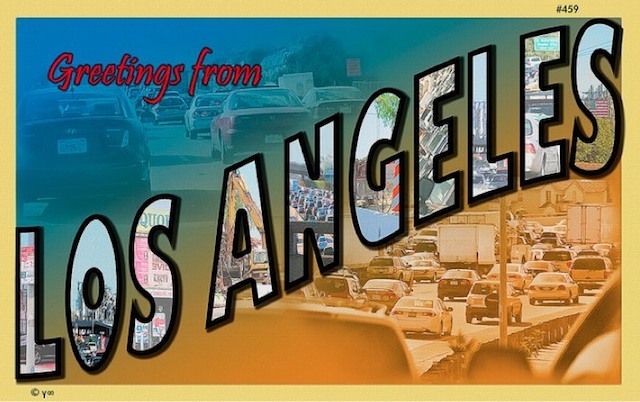 While we&apos;re still in good spirits about the massive shutdown next month, we&apos;re enjoying LAist Featured Photos pool contributor&apos;s Gamma Infinity&apos;s photo postcard inspired by Carmageddon. Greetings from, well, pretty much where you don&apos;t want to be.